We’ve had some lovely weather recently – clear blue skies and bright warm sunshine (which mainly means I’ve been hiding behind curtains in dark glasses like a vampire but that’s totally beside the point). Spring has well and truly sprung and there are buds and birds and blossoms everywhere: the world’s a beautiful place to be. But all this growth and life needs more than just sunshine – it also needs clouds and wind and rain and all sorts of other weather systems that I don’t know anything about. As lovely as blue sky and sunshine is, if it was all we ever had we’d end up living in a desert and that might not be so fun (I remember someone once saying there’s a reason the northwest is so green – it’s because it rains so much!). 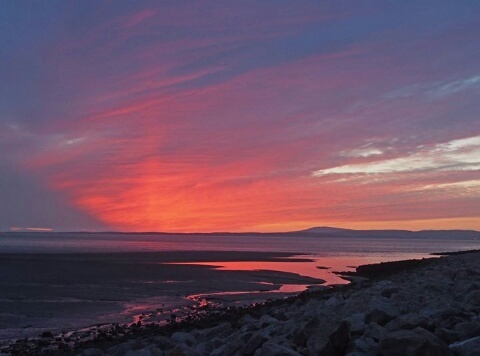 One thing I love about living near Morecambe Bay is the glorious sunsets we get. But I’ve noticed that the best sunsets seem to be after the worst storms. Perhaps it’s the same with life. As much as we might want them to pass, the storms and rainclouds in life can be the things that teach us the most if we let them. It might not be a pleasant process, but we need all seasons and all weathers to live and grow and learn and change. This entry was posted in Hope and tagged acceptance, change, chronic illness, growth, hope, learning. Bookmark the permalink. Wise words as always Nao! I need to remember that the rough, stormy, parts of life often end with the ‘best sunsets’. And thanks for the credit on the photo.